The foot is a very complex part of the body. It is made up of a great many bones, joints, muscles, nerves, and tendons. The foot has two important jobs to perform for the body. Those jobs are to propel the body forward and to absorb shock. Fortunately, the foot is perfectly designed to do those jobs. In order for either of those actions to occur, the brain and spinal cord must first receive messages from the nerve endings located in the feet. Those nerve endings send important information about the ground underfoot to the brain so that the brain can direct the feet to respond appropriately. The body’s message relay system between the foot and brain and the foot’s moving parts work together to form an advanced and complex machine. The foot contains 26 bones with 33 joints. This means that ¼ of the total number of bones in the entire body are located in your foot. More than 100 muscles, tendons, and ligaments are located in the foot, including the strongest tendon in the entire body. The foot is also the site of the most densely concentrated group of nerve endings, with a total of more than 200,000 nerve endings. There is a huge network of blood vessels in the foot, and over 250,000 sweat glands that release more than a pint of sweat each day. There are three major muscles in the foot. The gastrocnemius is the large muscle of the calf. The soleus is the lower muscle of the calf. The quadratus plantae are the muscles that are located in the sole of the foot. These muscles are very important, but it is actually the tendons that play the most vital role in the movement of the foot. The tendons provide a great deal of energy in proportion to their size. There are four main tendons that begin right below the knee and stretch down to the foot. Two additional tendons stretch down the interior of the ankle, go across the bottom of the arch, and connect at the tip of the toes. The four main tendons include the Achilles tendon, which is known for being the strongest tendon in the whole body. The posterior tibialis is the tendon that supports the arch of the foot. The flexor digitorum is the tendon that is responsible for helping the four small toes to curl, while the flexor hallucis is responsible for allowing the big toe to curl. The plantar fascia is the major ligament in the foot, and it provides tension from the ball of the foot to the heel. The job of the feet is to propel the body forward and to absorb shock. When the foot touches down against the ground, it absorbs shock from the ground. Then the foot begins to push off the ground again, and it acts as a rigid lever. A model known as the Windlass Mechanism is used to describe the action of the foot. Picture the arch of the foot as a triangle. The plantar fascia ligament is located at the base of the triangle and acts as a sort of tense cable. When you lift your toes up, the plantar fascia tightens around the metatarsal bones, pulling the arch of the foot higher. The more you flex your toes, the higher the arch of the foot is pulled up. This process of raising and lowering the foot’s arch is one of the most important roles of the foot. The toes also play a key role, because they are responsible for controlling the height of the arch. When the foot is about to be placed on the ground, the toes flex upward. This allows the foot to make contact with the ground when the arch is highest, which gives it full shock absorption capabilities. As the foot bears the weight of the body, the toes move down and the arch of the foot flattens out so that the shock of striking the ground is evenly distributed across the foot. 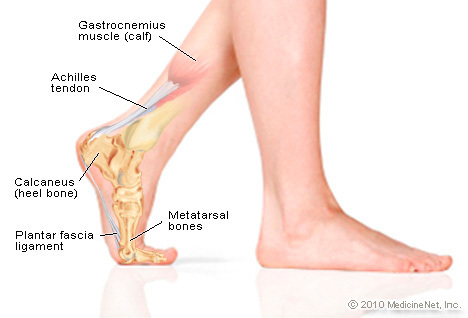 As the body continues to move forward in the gait cycle, once again the heel, toes, and arch all lift upward. This creates a rigid lever, which allows the body to move in a quick and efficient manner. The feet act as shock absorbers in three different directions. The first is pronation. Pronation is the motion of the foot during the gait cycle wherein the foot rolls inward to displace shock. When you run or jump, the foot strikes the ground primarily against the outside edge of the foot with the ankles turned inward. As the weight of your body is spread across the foot, the foot and ankle turn inward and the arch flattens out. The second way that the foot absorbs shock is through transverse arch flattening. There are five metatarsal bones in the foot. The transverse arch runs across these metatarsal bones. When you walk, the foot rolls inward across the ball of the foot, from the outside of the foot to the big toe. The foot makes contact with the ground beginning with the fifth metatarsal bone. Because the fifth metatarsal is so flexible, it provides a gentle impact. The transverse arch starts to flatten out, which widens the ball of the foot by about 15%. The third and final way that the foot absorbs shock is through the toes splaying apart. As the feet bear weight, the metatarsals widen, causing the toes to splay apart. This provides a stable base for the body. In addition, this splaying of the toes offers a greater area of contact with the ground so that the nerve endings in the feet can receive and transmit information from the ground. With all of this information about the anatomy of the foot in mind, you can select shoes that accommodate these needs. There are five major components to a shoe. The tip of the shoe is called the toe box. This area should provide plenty of space for the toes, which are the widest area of the foot. Depending on the shoe, the toe box may be round, pointed, or square. The middle section of the shoe on the top of the foot is called the vamp. This is the area where shoelaces or Velcro would be located. There are two soles in the shoe – the insole and the outsole. The insole is located inside the shoe, against the bottom of the foot. The outsole of the foot is the part on the bottom of the shoe that touches the ground. A softer sole provides greater ability to absorb shock. The bottom, back part of the shoe is called the heel. The heel gives the shoe elevation. A higher heel places more pressure on the balls of the feet and toes. The arch of the shoe curves inward to conform to the shape of the foot. To learn more about how you can select shoes that support the natural anatomy of your feet, visit Foot Solutions. We are a specialized shoe store (custom shoe shop) that offers a wide variety of arch supports & footwear, with many different options to meet your needs, so stop in to learn more today.